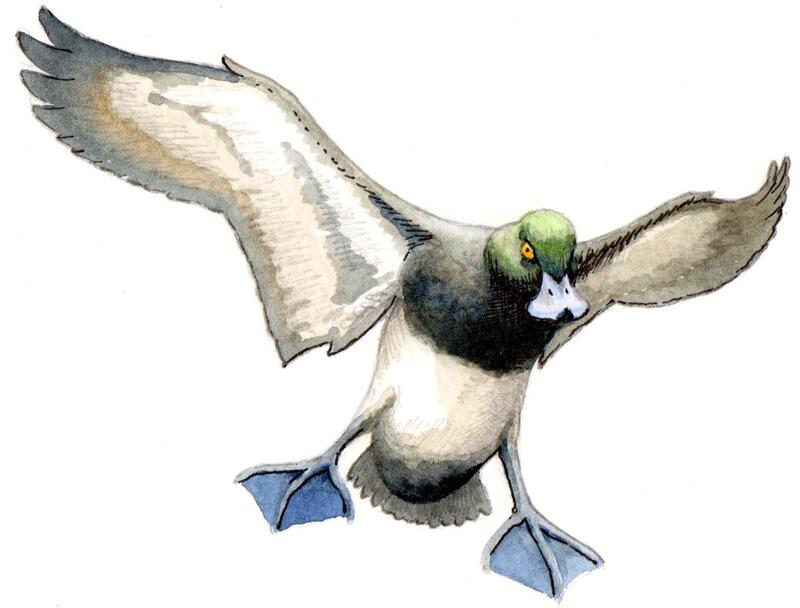 The idea of “flagging” waterfowl by waving an object at just the right moment has been around a long time. We have all been trapped amongst our decoys when birds arrive – probably attracted by our movements in an otherwise desirable spot. Like so many good ideas, I imagine that using a flag to purposefully grab a bird’s attention occurred to many different gunners in many different places. There are numerous accounts of battery gunners waving their booted feet in the air to turn ducks, geese or brant that seemed to be passing the rig without giving it the proper respect. I remember flags from my earliest days afield with my Dad – we never used one with puddle ducks but had good luck with divers, brant and geese. I also remember being frustrated when they were frozen into a solid mass or pulled away from the staff when the rusty staples began to fail. 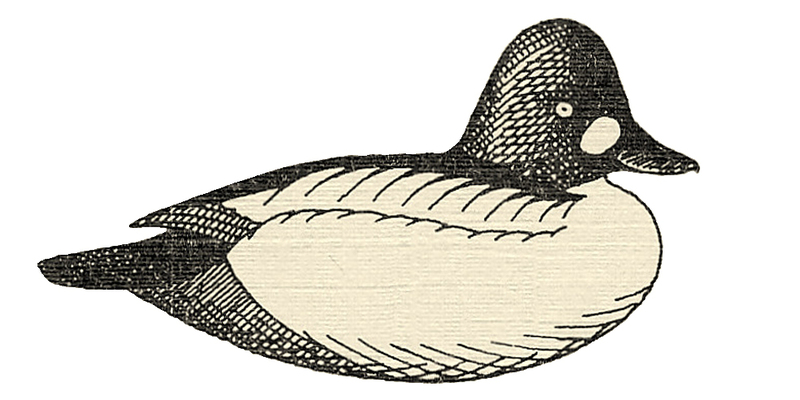 And so, I have developed – over much musing over many seasons – my thoughts on the “Model Perfect” (to steal a designation from George L. Herter) Duck Flag. Following are my thoughts on the features that make flags effective and durable – and have stood the test of time. As always, I more than welcome the thoughts and experiences of others. Freezing ~ I avoid freezing in my flags by making them of a fabric that will not absorb much water. Nylon is far superior to cotton in this regard. Nylon is readily available in most fabric stores and almost always in Black and White. Either can usually be found in rip-stop weave as well. Durability ~ Instead of simply tacking the cloth to the wooden staff, I sew a pocket in the flag into which the staff fits. “Action” ~ A downside to nylon is its lightness. In light airs, it can tend to wrap itself around the staff instead of flapping seductively like a duck’s wings. So, I add some ballast to the outer edge. To avoid rust and abrasion, I cut short lengths of #12 electrical wire (Romex) and sew them into a hem at the outboard end of the flag. They give just enough heft. Staff ~ To keep the nylon flag from sliding up or down the pole, I drill a small hole through the top of the staff and then hand sew through the nylon with a heavy, waxed nylon whipping thread. Finally, at the bottom end of the staff, I glue a Turk’s Head from some old decoy line. I provides a nice knob on the end – and sure adds some salt to the look. I rely on pages 28 and 29 in Hervey Gerrit Smith’s The Marlinspike Sailor to help me remember how to tie one. I draw it tight with the help of an awl (or marlinspike) and then epoxy it over the handle. I paint the entire staff with 2 coats of flat oil paint. 2 – Nylon cloth, measuring and cutting tools, and Seamstick to hold everything in place until the stitching is complete. 3 – The inner seams are sewn twice. 4 – Ironing with a fairly cool setting keeps everything in its place. 6 – Small lengths of #12 wire are used as weights. 7 – The weights are sewn into a hem on the outer edge. 8 – The sleeve for the staff is triple sewn. 9 – It is loose enough to avoid chafe. 10 – A small hole is bored in the top end of the staff. 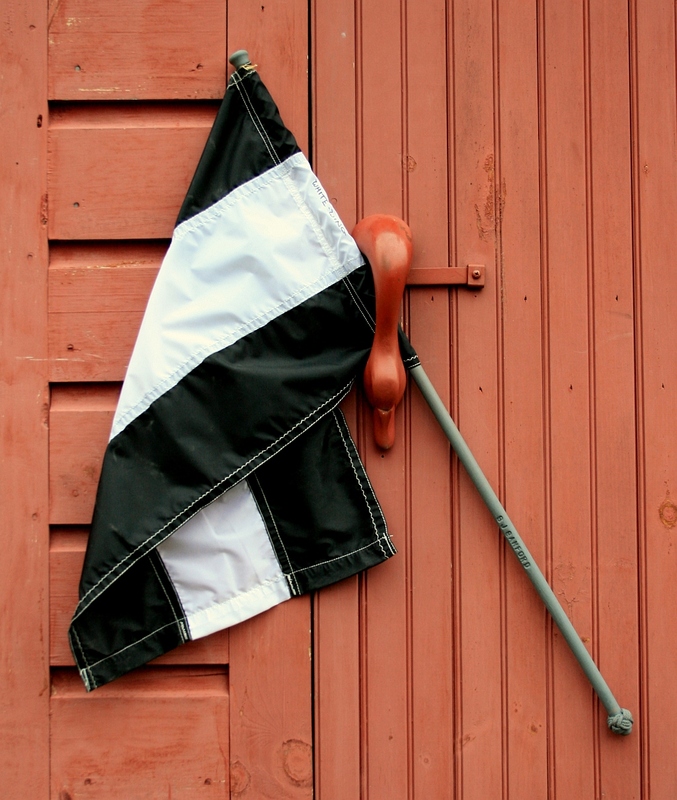 11 – The flag is sewn to the staff through the small hole. 12 – The staff is branded – just in case they go overboard unseen. 13 – A Turk’s Head serves as a knob on the lower end of the shaft. 14 – Pages 28 & 29 in The Marlinspike Sailor remind me how to tie one. 15 – The Turk’s Head is epoxied to the staff – then painted. 16 ~ Here is the painted shaft. 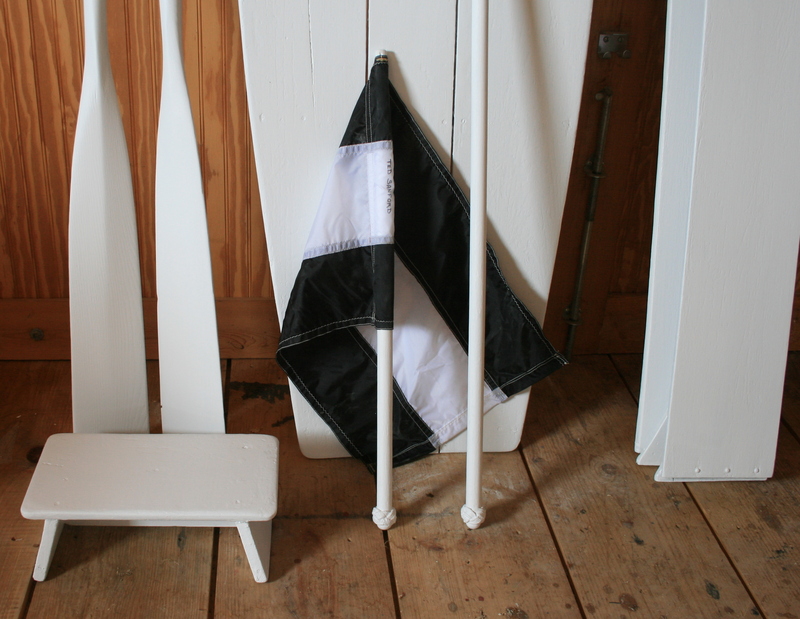 17 – Here are the flags for White-Wing and for the Ted Sanford. As always, I would enjoy hearing your approaches – and seeing your flags.